﻿ How to install vibrating feeder? 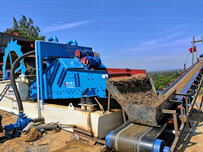 Location: Home » NEWS » How to install vibrating feeder? How to install vibrating feeder? Vibrating feeder adopts a pair of vibrating motors with identical performance parameters as the excitation source. In the production process, the block and granular materials can be uniformly, regularly and continuously fed into the next device. 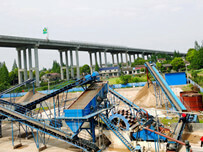 In sand production line, can continuously and evenly fed stones for crushers and roughly sieved the stones. It is widely used for feeding and screening in metallurgy, coal mining, mineral processing, building materials, chemical industry, abrasives and other industries. Vibrating feeder is mainly composed of trough, vibration exciter, spring support, etc. 1. 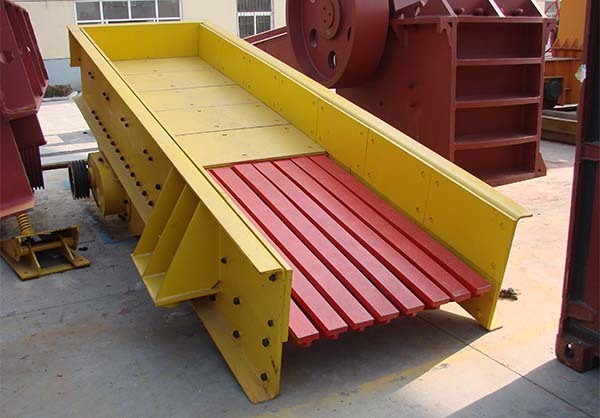 Feed trough: Trough is the conveying and feeding part. It is an integral frame structure and adopts ring groove rivet riveting. 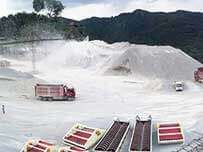 The trough lining is divided into: feeding section is blind (inclination angle is 0~5°) and discharging segments are rods (inclination angles of 15 to 20°). 2. Exciter: The vibration exciter is a key component of vibration feeder; the new vibration motor is used as the exciter, the performance is stable, reliable, and convenient to adjust. 3. Spring bearing: It adopts seat type installation and adopts steel coil spring as vibration damping spring, which is reliable in operation and long in service life. When vibrating feeder is used for burden and dosing, in order to feed materials evenly and stably, and prevent the materials flow automatically, the vibrating feeder should be installed horizontally. If it is used for feeding materials continuously, should decline 10°to install. For the viscidity materials with more water content should decline 15°. 1. After installation, there should keep 20mm clearance. 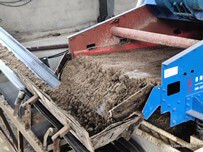 The vibrating feeder is horizontal in transverse direction, and the suspension device applies flexible connection. 2. Before no-load test, tighten all the bolts, especially anchor bolt. Retighten the bolts after running continuously for 3-5 hours. 3. The two motors should reverse rotation, the current is stable. Found abnormal situation should stop the machine immediately. 4. Adding the lubrication oil into the motor bearing every two months. In high temperature season, add the oil once a month.